If you liked the LAST Anchorman movie, chances are….you’ll find this one funny too. 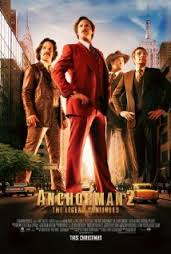 Fans of Ron Burgundy will know the legend continues…Someone remarked that this film runs too long. Yes, because most comedies run out of steam and the “bits” are just fillers to somehow wind down the plot. That is the nature of comic films. It has been said that Dying is easier than Comedy. Comedy is hard. However, the bottom line remains: this film does have some funny bits. The notion that Ron Burgundy came up with some of the ideas that are floating through the newsrooms of all current 24 hour news networks is hilarious in itself. And there is a definite jab at all the networks as the makers of this film lambast the idea of what “real” news is, as opposed to the idea that we are simply chasing the bright, shiny objects that flash before our eyes in each 24 hour news cycle. With that point out of the way, it’s good to note that the underlying thread running through this film is the idiocy of Ron Burgundy, the man. He is hopelessly politically incorrect, improbably lucky in his choice of jobs, and a veritable guide for the “what not to do” of life regarding personal and ethical relationships. His storyline is correctly followed with the inevitable line-up of all-stars that helped bring him to life. Steve Carrell, Paul Rudd, Christina Applegate and a cast of cameos by Harrison Ford, Jim Carrey and Liam Neeson make this film worth watching. Yet none of it is possible without Will Ferrell. His great talent lies in conveying the blankness behind the eyes and is followed with the extreme utterances of a man with “no one home”. One of my personal favorites is the scene in the RV with the gang heading into New York. Just the notion of getting the old “gang” together again is funny. But the humor is carried through in their choice of “day jobs” outside of local news. Not to give anything away, but the film moves along quite well from here, with the predictable making way for the ridiculous about half way through the film. See this film for light laughs and a chance to further the legend…By all means, it’s worth a chuckle or two.